Switzerland is one of the worlds best expat countries, with some of the highest living standards and a well-educated, multilingual population. Yet moving to Switzerland can still be stressful and difficult, if you don’t do it right. Mistakes can cost you money. Enzo Caputo, Swiss banking lawyer and relocation expert, says the challenges faced by expats vary a bit depending on where in Switzerland they live. Switzerland is a multi-cultural country with 4 languages. Its kind-of an island in Europe, its not part of the EU. And the cantons are autonomous republics, so all do things differently to each other. Switzerland is a real estate market dictated by landlords. In the main cities, demand out-strips supply many times over. There may be up to 60 applications per apartment. You need to make sure that your application is top of the pile says Enzo Caputo. The easiest way to do this is to use a registered relocation agent to help you through the process. Your agent can also be a Swiss law firm having experience with HNWI private clients knowing their needs and expectations better than any other agent. We offer impeccable relocation services for you and your family to Switzerland. A good relocation agent will not only have extensive contacts with landlords, but will also know how to guide you through the process to help you secure the home that you want. Furthermore, we are in a position to negotiate the lump sum taxation agreement with the local tax authorities for you. A professional tax lawyer negotiating your future tax bills can save you a lot of money. We will negotiate the lump sum taxation agreement for you. We know which cantons are the best and which municipalities need new tax money and are willing to offer best conditions with best tax treatment. It also important to make sure you get good advice on the lease. For instance, if you want to leave an apartment in Switzerland, under a standard Swiss lease you have to give three monthsnotice in advance respecting the right formalities, terms and conditions. We can assist you with all the problems you might have while moving to Switzerland and avoid them even before they happen. If flexibility is important to you, you need to make sure that you get the right clauses in the lease to make sure you dont find yourself in a difficult situation. We help you to find the right international school for your children. Switzerland has a long tradition with the best private schools in the world. If youre a citizen of an EU country, moving to Switzerland isnt like moving within the EU. To move to Switzerland, you need to have a lease on an apartment or to buy a real estate, says Enzo Caputo. To complicate matters further, a referendum last year backed further curbs on migration from the EU and for other countries. These restrictions have yet to be adapted within the legal framework, they could well present further difficulties to our new guests in Switzerland. Things are even tougher for people from outside the EU. Even those with a job as a specialist in a specific sector and a rental contract have to grapple with quotas. This necessitates prior planning – and knowing what youre doing. You need to start the process several months in advance, as your application needs to be approved by the Immigration Officer and the competent tax authorities. With the right contacts and our support you will move to Switzerland hassle-free and without worrying. Getting advice before you start the process will save you a lot of stress further down the line. If youre moving to Switzerland from Europe or North America, say, you might not expect culture shock to be a problem in Switzerland. But sometimes the fact that expats in Switzerland expect there not to be differences means they are all the more shocked when issues arise. If youre French, for instance, you need to be aware that though the language is the same, the culture is different. The Swiss start work early, and finish early. Punctuality is key factor and a sign of respect, in contrast to in France. Shops are closed on Sundays – something the people here voted for in a referendum.The extent to which you are affected by culture shock depends a bit on how much you choose to stay in the expat bubble. You can live a bit offshore, in an international community and in your work environment. But when you want to get into the real Switzerland youll find it different. But Switzerland is very welcoming to the foreign population and people are used to expats, so people will understand you, says Enzo Caputo. It is imperative to collect specific advice tailor-made to your specific needs and expectations before you start the process. If you need specific information tailor-made to your situation you should pick up the phone and give me a call +41 44 212 44 04. The first consultation is free of charge. Do not hesitate. There are many asset protection strategies you can consider. You can interpose certain legal entities or you can set up an insurance wrapper. You can structure your wealth in many different ways. You can diversify your assets in different banks located in different jurisdictions. You can participate to the program Citizenship by Investment and even buy a new passport in St. Kitts & Nevis or Dominica and open bank accounts using the new passport. One of the most efficient asset protection strategies is to relocate in a secure and stable jurisdiction. If you are successful and wealthy you have multiple choice of places where to live such as Malta, Monaco, Cyprus, Canada etc.. Each location has its particular advantages. Some of them have very attractive tax laws, some have very warm climate, some have a welcoming and multicultural population. Switzerland is in a position to offer and combine all the advantages: wonderful alpine skiing facilities, hot summers, high living standard with political and economic stability, social peace, multi-cultural cities, excellent health care infrastructure, very low crime rate and excellent public services. It offers the best private schools in the world since decades, first-class infrastructure like Singapore and Finland, effective law enforcement, efficient protection of intellectual property rights, moderate taxation, high productivity with high quality products and services. High quality buildings and properties are satisfying the most demanding and sophisticated individuals. You do not need body guards. Personal safety is assured at day and night. All this advantages attracted many celebrities from all over the world such as Frida Lyngstad from Abba Pop-Group, Roger Moore alias James Bond, Tina Turner, Alain Delon, Phil Collins, Victor Vekselberg, Russian investor, Latsis family, Greek shipping tycoon, Bernie Ecclestone, Michael Schuhmacher, Jacques Villeneuve, Kimi Raikkonen, Jean Alesi, Sebastian Vettel and others representing Formula 1, Athina Onassis, Boris Becker, Ana Ivanovic, Yannick Noah, David Bowie, Yoko Ono, Laura Pausini, Celine Dion, Daniel Hechter, Dimitry Ryboloviev, Ermenegildo Zegna and many others. They all choose to relocate to Switzerland. In Switzerland there are different levels of taxation: federal, cantonal and municipal level. The applicant should not conduct professional activity in Switzerland. Currently, the Canton of Zug requires a minimal taxable income of CHF 300000 and a minimal net wealth of CHF 6 million, whereas for the Canton Schwyz the minimal taxable income should be at least CHF 500000 per year and the corresponding net wealth at least CHF 10 million. Canton Zurich has recently abolished the lump-sum taxation regime. The political climate is not favourable and the demanded requirements are becoming more and more stringent due to the high demand coming from all over the world. The financial crisis and the illusive Arab spring has increased the number of filed and pending applications. Therefore, it is advisable to evaluate the option to relocate to Switzerland now or as soon as possible. Under the lump-sum taxation, the income tax basis is calculated based on the annual living expenses of the applicant and his family living in the same household. Based on a control-calculation (in German: Kontrollrechnung) the annual living expenses should not be less than 7 times (this leverage factor was increased from 5 to 7 recently due to the huge demand and political situation) the yearly rental expenditures for the apartment or the house where the applicant will be resident. This figure will constitute a surrogate tax base to calculate the taxable income. The taxable income will define the amount of tax which has to be paid. This calculation can be made based on a calculation available in the internet and depends on the specific domicile, i. e. name of municipality and name of the canton of domicile. Mr. Theo Müller, the founder of Müller-Milch, relocated successfully to Erlenbach, at the lake of Zürich, Switzerland, and by doing so, he avoided an astronomic gift and inheritance taxation in Germany. At a federal level there is no inheritance of gift tax duty. An applicant under the lump-sum taxation regime is authorized to take benefit from the very low gift and inheritance taxes, if they are in force in specific Cantons. There are cantons without any duty to pay inheritance and gift tax at all. That means that for each single applicant under this regime also the benefits of inheritance planning optimisation can be calculated, in advance, on a case by case basis. Mr. Theo Müller hired a number of capable tax advisers to save a fortune in favour of his next generation. Based on the bilateral treaties between Switzerland and the EU, the EU nationals are entitled to take domicile in Switzerland if they can cover their living costs and if they have a basic health care insurance. The situation is different if the applicant is a non-EU-national, for example a citizen of the Russian Federation. What is a substantial fiscal interest for the canton to relocate? According to article 32 of the Swiss Decree on Admittance, Residence and Employment the Office for Immigration can give an annual residence B-permit to a Russian citizen if a substantial cantonal fiscal interest can be credibly documented. Of course, each Canton has a different interpretation on what a substantial fiscal interest is. There are cantons stating that a taxable annual income exceeding CHF 500000, if agreed with the applicant, can be sufficient to be considered as substantial fiscal interest. Beside the above arguments there are other soft factors having an impact on what is considered a fiscal interest in this specific canton. In this case it is crucial to appoint an experienced negotiator which is familiar with the specific cantonal authorities and their actual interpretation of the law. The final tax assessment and taxation is not exclusively subject to a strict mathematic formula but depends also on a tactical approach during the negotiation. The most prestigious housing facilities are scarce in Switzerland. In the Cantons Schwyz and Zug the situation became difficult because many affluent HNWI have already bought or rented many of the super-prime residences. Contrary to the predictions of real estate experts property prices have increased even during the financial crisis. For villas located in hot spot areas with access to the Lake of the four Cantons it is not uncommon that prices have rocketing with double digit million amounts. In some cases, the best bidding party gets the property. In other cases, there is a very important confidentiality issue involving a celebrity selling the villa located in the hot spot which wants to remain anonymous. In such cases there are lawyers involved due to the advantages of the professional secrecy. Lawyers specialized in the relocation industry are frequently asked by real estate agents directly if they have a company owned by a client ready and financially capable to buy a prestigious high-end property. Such unique real estate opportunities and deals are off-market and are going to be passed over under the table, on a very confidential level. Due to bearer shares and due to banking secrecy nobody can pierce the veil of the legal entity easy and identify the new buyer. Its a people related business. Selecting lawyers as relocation advisers? A dedicated experienced advisor is much more efficient than a team of advisers because he has the overview of the process. A single advisor knows all factors having a direct impact on the negotiation with the tax officers of the specific Canton. An experienced advisor is aware of what is happening in other cantons and what arguments are more important than others during the specific negotiation with the specific officer in charge. He will achieve a more favourable result than a team of advisors because in a team we have the risk of wrong or non-information. Due to the last developments in the political environment in Switzerland the legal, fiscal and administrative aspects are becoming more and more important than the logistical aspects. Therefore, it has become essential to select a lawyer as your adviser. One of the first steps should be to select the right canton and the right school for the children. An experienced Swiss lawyer will be capable to negotiate and obtain a better tax treatment than anybody else. 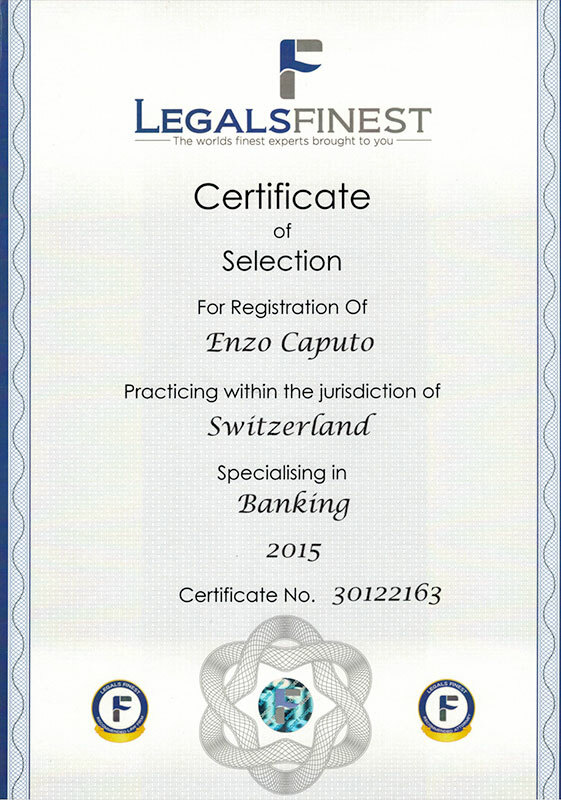 He has also better connections in case of the acquisition of a prestigious high-end property, says Enzo Caputo, Swiss banking lawyer of the law firm Caputo & Partners, Am Paradeplatz, Zurich, Switzerland (www.swiss-banking-lawyers.com). The relocation process of high-net-worth-individuals (HNWI) to Switzerland is a multi-dimensional process which requires legal, fiscal and administrative expertise and specific professional experience. The relocation process is complex but it is the most efficient asset protection instrument protecting your wealth. It is imperative to get it right first. Appoint an experienced lawyer in advance and safe money in terms of a more favourable tax ruling achieved during the negotiation with the tax authorities. It is crucial to have a good negotiator on board. The influence of relocated non-Swiss to Switzerland will introduce a new era with international mentality, with more international private schools, more art galleries and more international world cultures. Switzerland will remain attractive due to his quality of living and security. The financial situation in many European governments is scaring wealthy individuals and celebrities. The Switzerland is not member of the European Union and therefore the Swiss banking system is not under the supervision of the European Central Bank. The Arabic springtime triggers wealthy Arabs to leave their country. The space is limited in Switzerland and the high-end properties are scarce due to the demand of many celebrities and HNWIs. The prices for high-end properties are at a skyrocketing high – despite the crisis. Relocation to Switzerland is clearly an upward trend. It is for sure the right moment to think about securing a new place of residence in Switzerland. Have a free consultation with him and he will tell you how to move to Switzerland, which are the 5 best cantons and how to save a lot of money taking advantage from the lump sum taxation regime. Lump sum taxation is a special tax regime that can be used by non-Swiss nationals without a gainful employment in Switzerland. Many celebrities like Tina Turner, Michael Schuhmacher, Kimi Reikkönen, etc. are taking advantage of this regime. The taxpayers lifestyle expenses are used as a surrogate tax base, thats why it is not necessary to declare the entire global earnings/assets of the person moving to Switzerland. There are not many countries not concerned about your entire global assets. The surrogate tax base will then be subject to ordinary tax rates. If you want to start living in Switzerland, the resulting tax planning opportunities will save you a huge amount of money. – And no gainful employment in Switzerland A gainful employment abroad, including the administration of private assets, is compatible with the Swiss lump sum taxation laws. On 1 January 2016, the new tax regulations will be enforced. To be able to calculate income tax based on living expenses, taxpayer have to declare an amount that is equal to seven times the rental value or seven times the annual rental expenses of their principle residence in Switzerland. At federal level the expenses have to be at least CHF 400000. 2. The foreign income, if you want to make use of the benefits of double taxation treaties. In many Swiss cantons wealthy non Swiss residents can profit from Lump sum taxation, but not every canton has the same criteria or calculation method, and some cantons have even abolished their lump sum taxation system. There are, however, certain cantons that are known for being very attractive because of the liberal regulations concerning lump sum taxation. These cantons are better minded than others, in accepting foreign guests as residence in their canton they profit from wealthy and able individuals or families, who decide to take residence in our beautiful country. At the same time as these wealthy individuals take residency they contribute towards the fiscal health of the canton, reducing the tax burden for the existing local residents. In doing so everybody becomes happy and content for living in such low tax cantons. The best cantons are Luzern, Schwyz, Zug, Nidwalden and Ticino. Therefore, its very important to get informed about lump sum taxation before you attempt your move to Switzerland. The selection of the right canton can be decisive upon the future quality of your life. One such canton with intelligent local authorities is the canton of Zug. When driving along the beautiful lake of Zug, pasting through the ideally and clean farms, you might be slightly bewildered by a sign at the entrance of the cantons capital. It welcomes you in Arabic to the town, where 128 peace loving nationals have come together contributing towards the well-being of all in the county. About a quarter of the cantons population are non-Swiss and only 88 per cent stemming from Europe. Going back to our first saying in how to create a wealthy and a happy environment, according to the Federal Health Office, 92 per cent of the people living in Zug consider themselves happy and very lucky to live in such beautiful canton with a very low rate of criminality. If you are thinking of moving to Switzerland, you should reserve a free consultation session with Enzo Caputo, Swiss banking lawyer and relocation specialist in Zurich. He will inform you on the latest developments in immigration laws in different cantonal jurisdictions in Switzerland. Unjustified lawsuits, invented claims, bankruptcy, asset seizure and increasing liabilities risks, any place is becoming a more and more dangerous menace to any wealthy individual. A myriads of governments in the EU and elsewhere run out of money. They are targeting rich people which are forced to repatriate their funds. Such forced repatriation had devastating effects on the wealth of some clients. It is of paramount importance to set-up asset protection structures also in Europe. In the USA, for example, such asset protection structures are well-known since decades. Most of medical doctors in the USA have asset protection instruments in place. They want to be protected in case rapacious US-lawyers invent legal claims targeted at seizing their assets. Sport professionals and CEO’s are taking advantage of asset protection tools such as life insurance products, insurance wrappers and Swiss annuities products. Many governments are searching for new assets located in offshore jurisdictions attacking the Swiss bank secrecy legislation. The long arm of the US-jurisdiction under the guide of the Obama administration invented the Foreign Account Compliance Act, known as FATCA. This new law will put all banks and financial intermediaries under massive pressure around the globe and force them to act as a representation office of the Internal Revenue Service, the fiscal authority in the USA. In the summer 2013 the Obama Administration has instructed the US Department of Justice to prepare and launch a new so-called Program: US Non-Prosecution Program For Swiss Banks. Swiss Banks have been extorted by the USA to infringe Swiss domestic laws in connection with banking secrecy and data protection law and to denounce US clients combined with self-reporting duties imposed to Swiss banks. There is an increasing need to legally protect assets. Let us negotiate for you a tax ruling with the competent Swiss tax authority. We will do that first on a fully anonymous basis. In case of interest and commitment we will open our cards to the involved authorities and not before. Engage us as your attorney and not a relocation company. Engaging us you will benefit from the client attorney confidentiality privilege. We help you to find the right real estate, school for your children, hospital and many other things which can be useful for you. Swiss banks are forcing clients with non-declared funds to close the account immediately – refusing cash pay-outs! The bank has mismanaged your assets? In which cases will we recover your assets? We have other asset protection tools: Buy a new passport (100% legal), for example a St. Kitts & Nevis Passport. Based on this passport we will open a new bank account in Switzerland taking advantage from the Swiss banking secrecy legislation. By investing some funds in St. Kitts & Nevis the investor has the right to become a new nationality without physical presence in St. Kitts & Nevis. We offer a wide range of tools such as residence permit and banking in Andorra, residence and tax holidays in Greece if you invest at least EUR 250000.”in real estate in Greece, domicile in Austria, discretionary and irrevocable trusts and family foundations, fully tax-compliant with the home jurisdiction of the client, Swiss annuities with prime Swiss insurance companies ensuring better client protection than Swiss banking secrecy, insurance wrappers. According to your needs and expectations we will find the most protective and tax-efficient solutions for you and your future generations. Do not hesitate to call us and collect all useful information in connection with state-of-the art asset protections tools tailor-made to your needs and expectations.